Ross-on-Wye Support Group are a small friendly group of people who use the Mighty 8 Sports Club Ross-on-Wye as our headquarters. We are now entering our fourth year of supporting Acorns Children’s Hospice. Our policy is, a stress-free, happy support group with the emphasis to engage fun and humour with every event that we plan and organise. The sponsored events that we have held to date include race nights, raffles, auctions, skittles, Bar-b-q, 6 mile walk, fancy dress bike ride, head shave, Hawaiian nights, Harry’s Day,10k & fun run, Triathlon and fun days. A lot of fun, with the hard work from the dedicated team, has so far achieved over £40,000 of financial fundraising for Acorns. 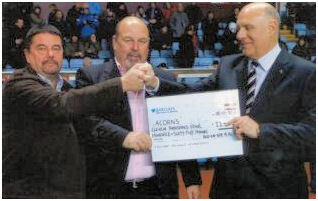 Within the past 3 years, the fundraising team have also raised £957 for Aston Villa old stars Football Club, £180 for St John’s Ambulance Brigade, £477 for wyenot.com, and £600 For Josh freeman.